Tool Fab’s indexable carbide shank boring bars utilize a V-braze for strength, rigidity and durability. 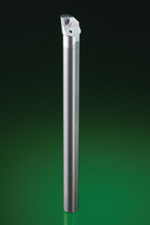 These are standard items available in RH or LH designs in solid or coolant-through shanks. Standard ISO inserts are available from Tool Fab at very competitive prices. Off-the-shelf delivery in both right and left in standard sizes. Insert pocket is rotated 90° from the braze for maximum strength and long-term durability run after run. Each indexable boring bar comes with Tool Fab’s unparalleled technical service and years of tooling experience. Tool Fab Screw Part No. *Note: Please specify C-2 or C-5 Carbide Grade.